First stop on my trip is to Sally Beauty Supply. 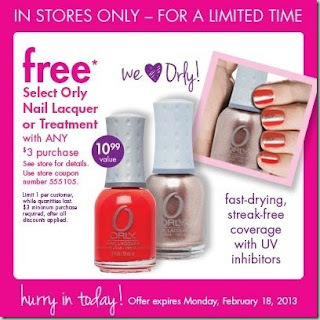 Sally Beauty is offering a FREE Orly Nail Lacquer or Treatment with ANY $3.00 purchase through 2/18 !! woop woop. Check our their post about this promo here. 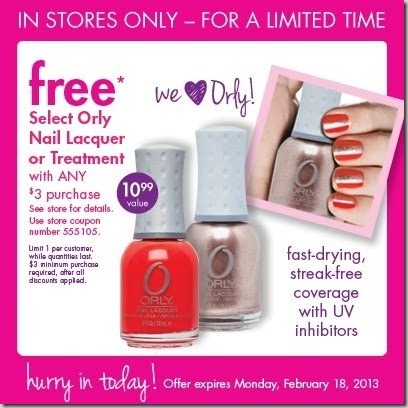 I've also heard that they have tons of polishes on clearance too! Then I want to hit up Target to take advantage of this awesome deal on Alexia Products. I wonder how much the onion rings are ? LOVE them !!! There is also a pretty awesome deal on Pampers Easy Ups, which I'm definetly getting to help with potty training my Sophia. Plus you earn a $5 Target Gift Card !! What is your shopping plans for this week ? Thank you dealznstealz4mommy & thecentsableshoppin for giving me the heads up on these deals ! I really need to start couponing. I only use them occasionally but need to save money.